55 Km northwest of Patna, situates the significant Buddhist pilgrimage site of Vaishali. A pilgrimage to Vaishali would prove not just an ideal escapade from the cacophonies of modern life, but is also an engaging immersion in the rich historical tapestry of its heritage. The land is blessed to have borne the footprints of Lord Buddha, to have prepared the sacred chalice for many of his discourses and some significant events that mark his illustrious life. A stroll across the rural landscape lets one partake in its rich and varied history. The historical remains of Vaishali are strewn across a large geographical area of the rural landscape of Besarh, Bakhra and Kolhua in Bihar. Vaishali, which was once lost to popular imagination, was rediscovered by surveys conducted by Cunningham and Stephenson in the nineteenth century. The writings left by Chinese traveler Hiuen Tsang had been a major historical source for identification and verification of Vaishali. 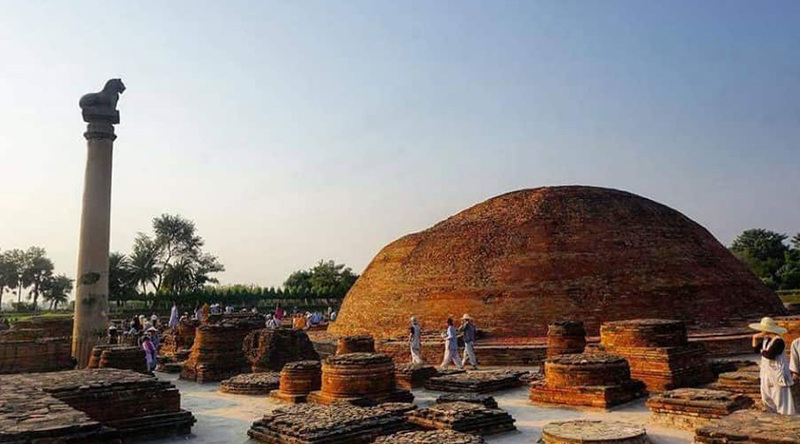 Site of Second Buddhist Council – One of the landmark events Vaishali witnessed is the second Buddhist Council, held seventy years after the death of Lord Buddha. But it is its having been the sacred ground for Buddha’s own discourses and teachings that makes Vaishali a significant destination in Buddhist pilgrimage circuit of India. Monkey offering honey – Buddhist narratives relate a particularly heart-touching event of Buddha’s life that took place in Vaishali. It is interesting to note that many anecdotes of Buddha’s life involve animals as characters as well. Once, a monkey felt inspired after observing Buddha being brought fruit and water by an elephant. Resolving to offer a gift to the great spiritual being, the monkey procured a honeycomb free of honeybees for him. After realizing that Buddha would not eat the honey since it contained flies’ eggs which would have been harmed had he eaten it, the monkey carefully removed the eggs and offered it over to Lord Buddha. Buddha gladly accepted the honey and ate it. The monkey could not contain his joy and began to dance and leap from branch to branch, which caused his untimely death due to a fatal fall. The tale ends with Buddha predicting that the monkey’s soul would soon seek rebirth in Trayastrimsha heaven. The story is significant for it points to the universal nature of Buddhist teachings- that the cycles of birth, death and rebirth as well as promise of salvation, release from the incessant Samsarik cycles, is not just open to human beings but all sentient beings. Also, Buddha received revelation about his own imminent physical demise after watching the sudden death of the monkey. Buddha’s visit to Vaishali prior to enlightenment – After Prince Siddhartha abandoned a householder’s life and his rights over inherited kingdom of Kapilvastu to seek the Truth of existence, it was to Vaishali that his footsteps treaded to learn under the renowned teachers of the time – Alara Kalama and Ramaputra Udraka. Organisation of Bhikkhu Sangha as per Vaishalian Democracy pattern: Vaishali is celebrated in history as one of the first republics of the entire world for its roots date back to 6th century BCE. Buddha is alleged to have organized Bhikkhu sangha after drawing inspiration from the democracy of Vaishali. A Sangha is the name for monastic community of bhikkhus (male monk) and bhikkhunis (female monks) in Buddhist circles. Buddha’s establishment of Bhikkhuni Sangha – It was at Vaishali that women were first let into the Buddhist monastic order due to the efforts of Maha Prajapati Gautami, Buddha’s stepmother and maternal aunt, and the prodding of Ananda, his favourite disciple. In fact, she was the first woman who was initiated into this world’s first Bhikkhuni Sangha. Buddha’s resolving the drought of Vaishali – Buddhist commentaries give detailed narrations of his visit to Vaishali in the fifth year post his enlightenment. The land and its people were ravaged by drought and sickness. The rulers decided to invite the great spiritual leader into the city and received him with utmost veneration. Upon Buddha’s stepping foot on the land, thunderous clouds poured showers upon the parched terrains of the land. Later, the people were freed from ominous attacks of evil spirits by the recitation of Ratana Sutta. Buddha’s visitation to Amrapali’s home – Lord Buddha is said to have visited Amrapali, the legendary courtesan and dancer of Vaishali. At the end of the meeting, the beautiful courtesan is said to have been so influenced by his teachings that she entered the monastic order and donated her gardens for the purpose of his teachings. Buddha’s last visit to Vaishali – It was at Vaishali that Lord Buddha predicted of his final leave-taking from the physical world, of Mahaparinirvana, which were to happen three months later at Kushinagar. Buddhist narratives describe the spiritual teacher’s spending the last monsoon season of his life in Vaishali. Also, Buddha is said to have offered his begging bowl to Vaishali’s people and delivered his last sermon before departing towards Kushinagar. The most prominent of historical relics in Vaishali, Ashokan Pillar is a 18.3 m high red sandstone pillar built by Emperor Ashoka. The pillar though doesn’t bear any inscriptions of King Ashoka. The pillar has a life-size statue of lion on its top. Also, a small water tank called Ramkund is situated beside the pillar. The present site consisting of this pillar built adjacent to a hemispherical, brick Stupa is said to have been the sacred ground at which Lord Buddha delivered his final sermon. Ashokan Pillar forms the most striking but not the only major attraction in Kolhua’s landscaped park. In fact, it appears as if the 2300 year old Ashoka Pillar with its magnificently carved lion perched on its top is guarding the sacred site. Strewn around the pillar are several ruins of monastic buildings in which Lord Buddha is said to have spent many rainy seasons. This is also cited as the site in which the famous incident of monkey offering honey to Buddha took place. World Peace Pagoda, or Vishwa Shanti Stupa, adorns the landscape of Vaishali as a symbol of tranquility and invocation for world peace. Constructed by Japanese Buddhists in 1996, this beautiful modern building is a major tourist attraction of Vaishali. One comes across a dilapidated form of what was once a 12 m tall Stupa. Lord Buddha’s ashes were buried here, along with seven other sites across the world. Its age dates back to fifth century. If you set foot along the 5 km long single-lane village road from Buddha Relic Stupa, you would reach Kolhua Complex, famous for its Ashoka Pillar and ruins of monastic buildings. A tour to this historical site would be deemed incomplete without visiting its archeological museum. Witness 1000 year old Buddhist statues and 1st-2nd century AD toilet pan among its notable artifacts. Other tourist attractions of Vaishali include Bawan Pokhar Temple, Abhishek Pushkarni, Raja Vishal ka Garh, Ramchaura Mandir, Kundalpur and its two Buddhist Stupas. If you plan to visit Vaishali by air, alight at Patna Airport. Vaishali can be easily reached by road from all major cities in Bihar – Patna (55 km), Nalanda (140 km), Bodhgaya (163 km), Rajgir (145 km), Muzaffarpur (37 km). One needs to board at Hajipur railway station. It is a just a 2.5 km long drive from Railway station to Vaishali.